With wedding season in full swing and the weather cooperating with us, we are getting creative with our looks yet again! The thought of an ordinary sari, or a lengha just isn’t cutting it with the RAR girls, so we are digging into our wardrobes to see what else we can come up with. Of course, for some looks, we have our Indian designers to thank for inspiration, who we will be dishing on in the coming weeks. And yet, here is another sari drape that has been making us swoon! We recently saw some Bollywood glams styling their saris with two palus and can’t get enough – we know, as if one wasn’t hard enough to do, the fashion world is adding another! We couldn’t help but try it out ourselves and are sharing some tips and tricks in making it happen! We know it’s going to be hitting this wedding season by a storm so start looking through your wardrobes for a sari and matching dupatta! The key to making this drape work is finding the perfect combination of sari and palu. Ideally you want them to be opposites – one should be solid while the other is printed or floral. 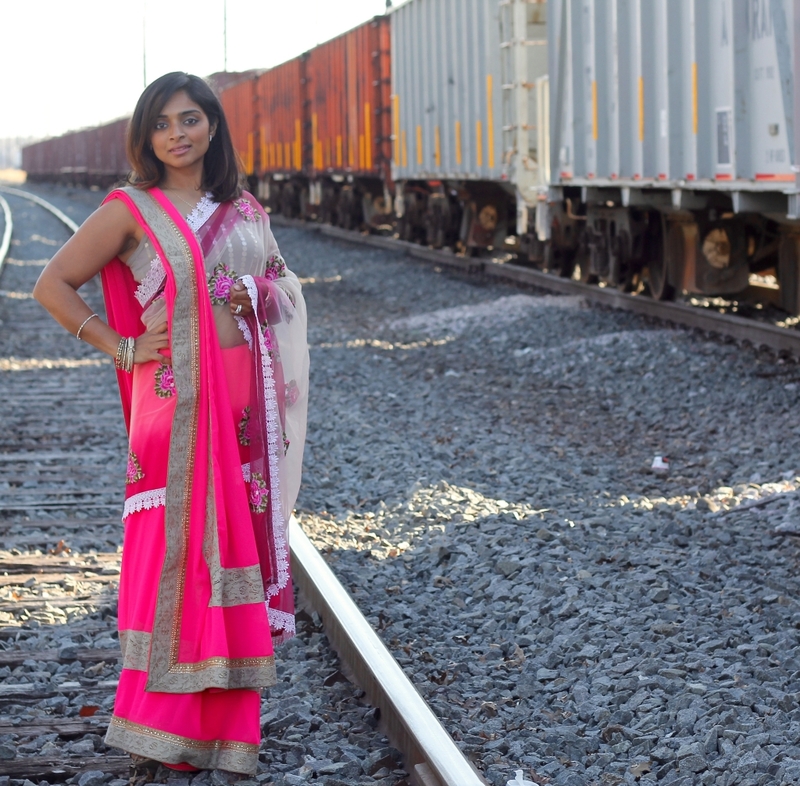 We decided to do with a bold, solid color sari and a net floral dupatta. We would have wanted the dupatta to be solid instead of net but this combination worked so well that we decided to go with it! The two drape styles here are Gujarati and Bengali with the palu out. The sari is Gujarati style without draping the front across while the dupatta is draped Bengali. In an attempt to write this out, start with the sari, start draping it as you would any sari (check out our video on how to start all sari drapes). Once you’ve made the first round, stop and add the dupatta. Start draping it from the middle of your belly as if it was the palu of the Bengali style. 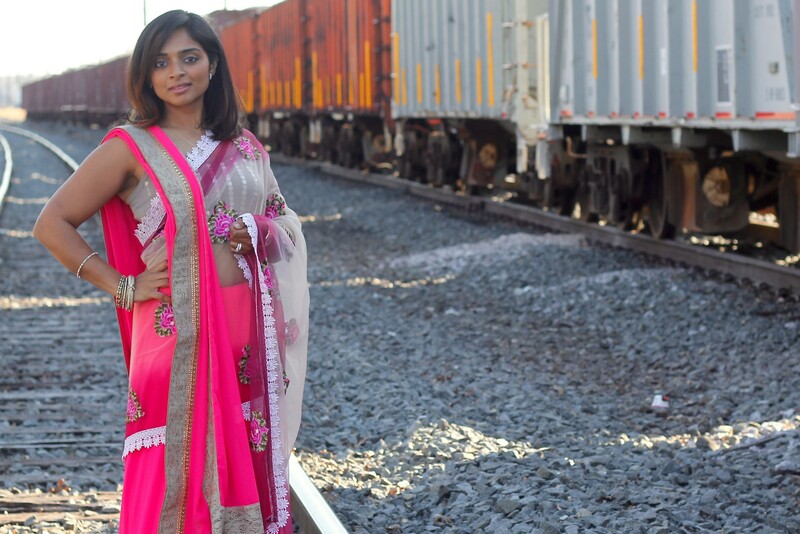 Once you’ve draped that over your left shoulder, pick the rest of your sari up and finish it Gujarati style! It takes a few tries but eventually it comes out pretty cool!! Isn’t is awesome! We can’t get enough of it! If you end up trying this drape be sure to tag us with #runwaysandrattles! And check our Instagram for some fun video shots (Sheena / Nina / Dipti)!